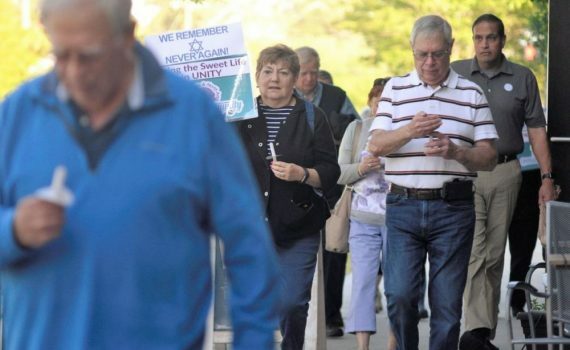 Summerville residents joined others across the nation this week in honoring the lives of the 11 million people killed during the Eastern European Holocaust between 1938 and 1945. The local observance is part of the national Days of Remembrance observed April 8-15. Thursday Summerville’s Town Council meeting began with a reading of the Holocaust Proclamation issued from the REMEMBER Program for Holocaust and Genocide Awareness; next a group walked silently to Short Central for a candlelight vigil at the Jewish heritage marker there. Local volunteer and advocate Robyn Wittenberg Dudley helped organize Summerville’s remembrance; she told a group of about 30 people in attendance about her uncle, Avram Steinberg, who managed to escape from a prison camp during the Holocaust. “He was one of the lucky ones who got to live his life,” Dudley said as she lit a candle in remembrance of the rest of Steinberg’s family who all perished. Dudley invited others to step forward and light a candle for the 6 million Jews who were murdered and the 5 million others who were persecuted for their religious beliefs. Denise Deveaux, a world history teacher at Northwood Academy and a Holocaust educator said her parents had to leave Hungary in 1944 because the country was giving up its Jewish people and sending them to the Auschwitz concentration camp. In his closing prayer, Rabbi Greg Kanter from Charleston’s KKBE Synagogue, thanked God for the “bittersweet gift of memory.” He said people must continue to remember and teach what happened during the Holocaust so that it never happens again, to any people anywhere in the world. The Charleston Jewish Federation and the City of Charleston will conduct the Annual Community-Wide Holocaust Remembrance Program at 2:30 p.m. April 15 at the Gaillard Center Ballroom, 95 Calhoun St. in Charleston.